How far away can spacecraft be seen with an optical telescope? note: For the purposes of this question "optical" means near-UV through thermal IR, let's say 0.1 to 30 microns. In the question At what time in the Apollo 14 mission did the maneuver shown in this image happen, and what exactly was happening? I've included the image and information below. The caption says that Apollo 14 CM & LEM and the Saturn IV B were "40,000 miles from Earth" at the time, or about 64,000 km. @X's answer estimates this to be at about 03:02:29 into the mission. Question: How far away can spacecraft be seen with an optical telescope? note: For the purposes of this question "optical" means near-UV through thermal IR, let's say 0.1 to 30 microns, and "seen" means it's existence and position determined in some way, either via recorded digital or film image, photomultiplier, or even reliable reporting by an experienced visual astronomer. In a search for information for this answer I received this google books link of Comment: The Relevance of Space, by Arthur Kantrowitz, Bulletin of the Atomic Scientists 197, 4 April 1971, pp 32-33. It includes the image below, I've retyped the caption for easier reading. 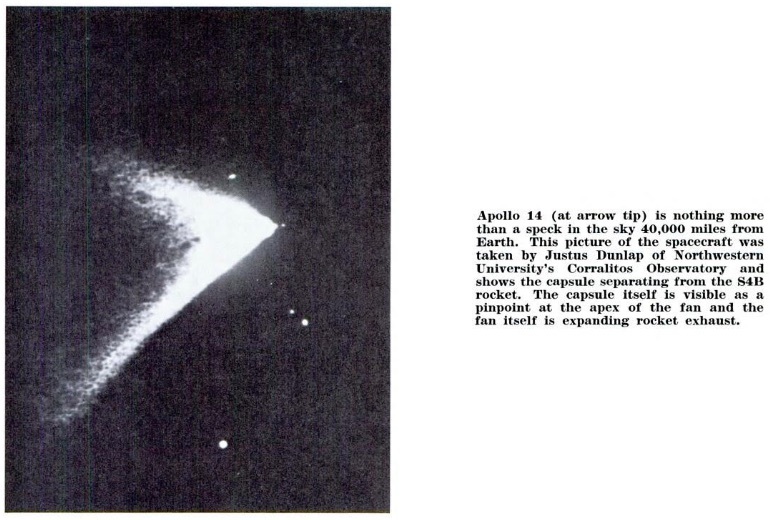 Apollo 14 (at arrow tip) is nothing more than a speck in the sky at 40,000 miles from Earth. This picture of the spacecraft was taken by Justus Dunlap of Northwestern University’s Corralitos Observatory, and shows the capsule separating from the S4B rocket. The capsule itself is visible as a pinpoint at the apex of the fan and the fan itself is expanding rocket exhaust. See the post Whats the farthest distance a spacecraft has been detected (except by radio) on the Astronomy StackExchange. As of 2019 Jan 7, those answers list observations of OSIRIS-REX at 12 million km, the Rosetta at about 5 million kilometers, and the Gaia at about 1.5 million kilometers (observed "systematically" at the Earth-Sun L2 location). I'd say that currently the answer is "at least 2.2 lunar distances". According to this source, 2006 RH120,believed to be an Apollo third stage, was "2.2 Lunar Distances", about 890,000 km, away at (re-)discovery; photos are provided at the first link. Another possibility is J002E3 a.k.a. the Saturn IVB third stage of Apollo 12 which has a similar orbit; photos here. According to this expert answer to the question When was the last time that Starman/Roadster was seen? the last time was at 2018-03-19 03:22:33 UTC. Subtracting and taking the norm, the distance was about 11.668 million kilometers, or about the same as the "12 million kilometers" in @johnholtz's answer. So as of now, it's a toss up until we get more digits on OSIRIS-REX! The relative velocity was 3.435 km/sec. These are the instantaneous positions, I haven't turned on any light-time corrections yet, but at only ~40 seconds that wold only be of order 100 km. On Sept. 2, 2017, the Large Binocular Telescope on Mt. Graham, Ariz., imaged OSIRIS-REx as the spacecraft approached Earth. This is the first Earth-based view of the spacecraft since its launch on Sept. 8, 2016. Not the answer you're looking for? Browse other questions tagged deep-space observation telescope or ask your own question. When was the last time that Starman/Roadster was seen? Hijacked space data, notable instances of recovering images or other goodies from someone else's space mission? How could tiny Hagoromo have been seen visually from earth confirming its lunar orbit? What do you call the Apollo LEM plus CM (Command Module) when they are connected? Why was the Hubble Space Telescope purged with nitrogen gas? 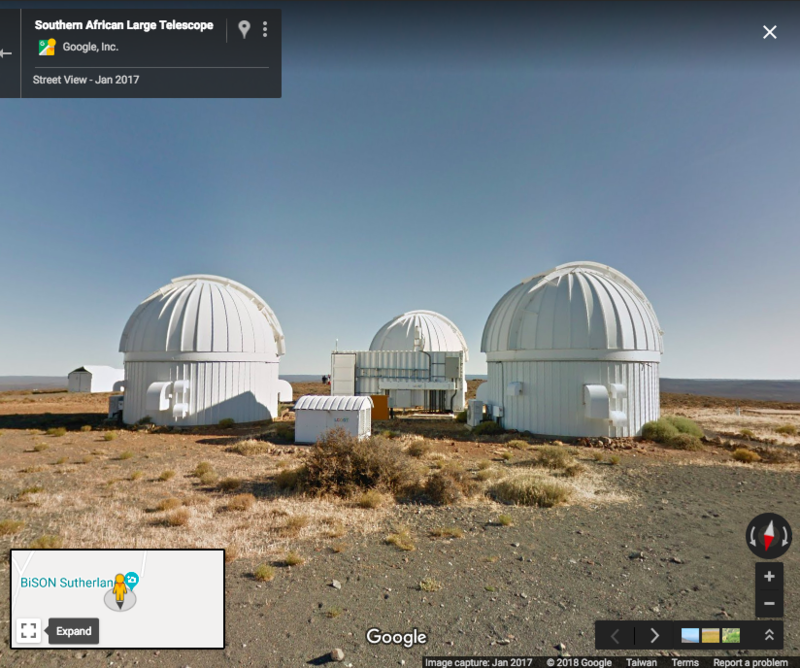 What observatory had the best optical telescope in the 1960's, based on faintest apparent magnitude it could image? How powerful a telescope would be needed to equal New Horizons'? How do we track the exact location of the spacecraft which is millions or billions of miles away from us? How was radio telescope observation data transferred before wide availability of high-speed Internet? How can I find which chemical compounds can be seen on Titan's surface? How to start with back yard space exploration? What optical design is used by the GEDI's receiving telescope and how is the secondary held in place?